Nanotechnology for Food Packaging: Materials, Processing Technologies, and Safety Issues showcases the latest research in the use of nanotechnology in food packaging, providing an in-depth and interdisciplinary overview of the field. Nanoscale advances in materials science, processing technology and analytical techniques have led to the introduction of new, cheaper and safer packaging techniques. Simultaneously, the increasing use of renewable nanomaterials has made food packaging more sustainable. Chapters provide a comprehensive review on materials used, their structure–function relationship, and new processing technologies for the application and production of nanotechnology-based packaging materials. 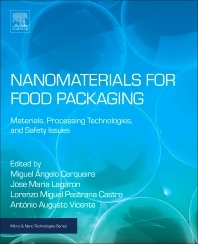 In addition, the book discusses the use of functional materials for the development of active, smart and intelligent packaging, possible migration and toxicity of nanomaterials for foods and regulatory aspects, and commercial applications. His research focuses on the development and characterization of nanostructured systems for food applications. Lorenzo Miguel Pastrana Castro is based at the Iberian Nanotechnology Laboratory, Braga, Portugal. His research focuses on the development of nanotechnology applications for active packaging. António Augusto Martins de Oliveira Soares Vicente is an Associate Professor at the Centre of Biological Engineering, University of Minho, Braga, Portugal. His research focuses on developing functionalized nanostructured delivery systems for food applications.